Yoghurt (or yogurt) is much more delicious sounding than the process. Yoghurt is a dairy product that is created by the bacterial fermentation of milk. These bacteria are known as yoghurt cultures. Yoghurt is considered something of a wonder food, as it aids health, provides calcium and the bacteria actually aids in digestion while also tasting delicious. Yoghurt can be eaten with fruit, honey, salt with pepper as well as almost anything else. Yoghurt can make a great dip and when added to foods provides a solid tang. Heat 4 cups of cow's milk on the stove. The ideal temperature is 82 degrees Celsius (a thermometer helps greatly). If you do not have a thermometer, simply bring the milk to a full boil, that will do the trick. Let the milk cool to 43 degrees (110 degrees Fahrenheit). 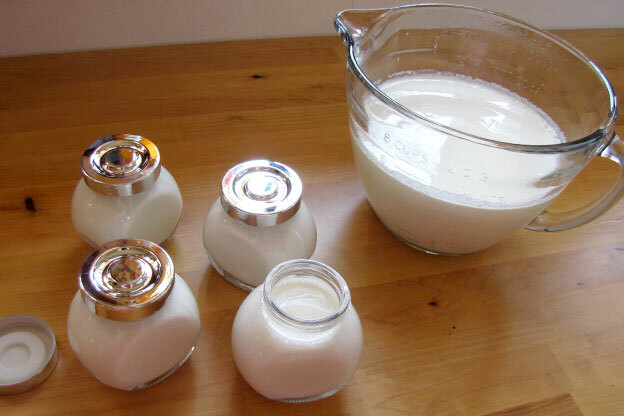 Add 2 tablespoons of yoghurt in a clean jar large enough for the heated milk. This can be either store bought or from a previously made batch. You require the bacterial cultures in the yoghurt. Add a bit of cool milk from your fridge to the yoghurt and stir together. Pour the heated milk into the jar. Be careful to not scald yourself in doing so. Cover the jar with its cap and wrap it in a towel if possible. The idea is to keep the jar as warm as possible for 8 hours. This allows the bacteria to work its magic. - pouring hot water into a cooler and adding the jar into the water and closing the cooler. After 8 hours, check to see if the yoghurt has thickened. Place the jar into the fridge when it has and enjoy cool, fresh and home made yoghurt when it cools!